Price and Kensington Honey Bee mugs are made from fine china and have a 340ml/12oz capacity. 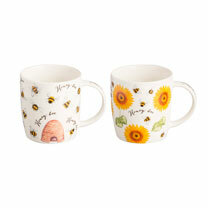 The mugs are decorated with two hand-painted designs featuring buzzing bees and sunflowers. Set of 6.